Slide the hard plastic insert into the top sleeve (Fig 1). Secure the (2) hard plastic shelves onto the horizontal dividers with the hook-&-loop fasteners(Fig 2). Place items like recovery gear, clothing, towels, groceries, first aid kits, road side equipment, snacks, etc. in the (4) main compartments. Place smaller items in the inner mesh pouch (Fig 3). Close the zippers and secure the hook-&-loop closures at the bottom of each compartment (Fig 4). Position the bag behind the rear seat. 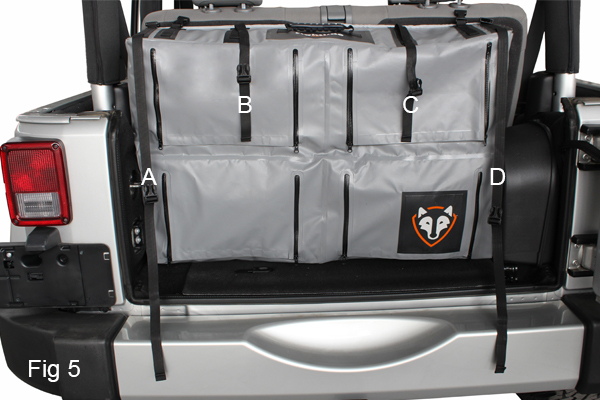 The top of the bag should follow a straight line, parallel to the top of the rear seat (Fig 5). Buckle (2) of the rear side straps through their matching attachment rings on the bottom of the rear seat (Fig 6). Buckle the A strap around the left rear vertical roll bar, above the seat belt holder, without twisting the strap (Fig 5 and Fig 7). Buckle the D strap around the right rear vertical roll bar, above the seat belt holder, without twisting the strap (Fig 5 and Fig 8). Buckle the B strap around the left headrest, without twisting the strap (Fig 5 and Fig 9). Buckle the C strap around the right headrest, without twisting the strap (Fig 5 and Fig 10). Tighten all (4) straps. 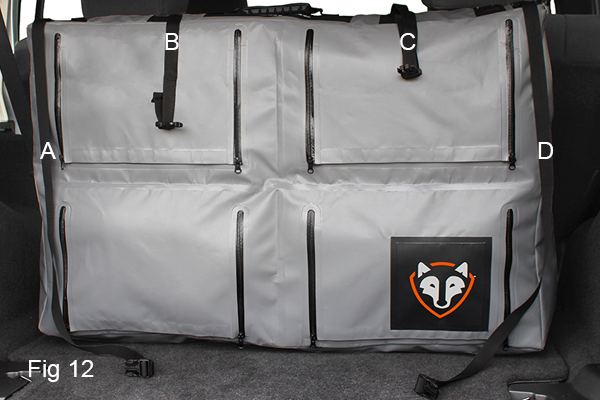 The top of the bag should follow a straight line, parallel to the top of the rear seat (Fig 11). Position the bag behind the rear seat. 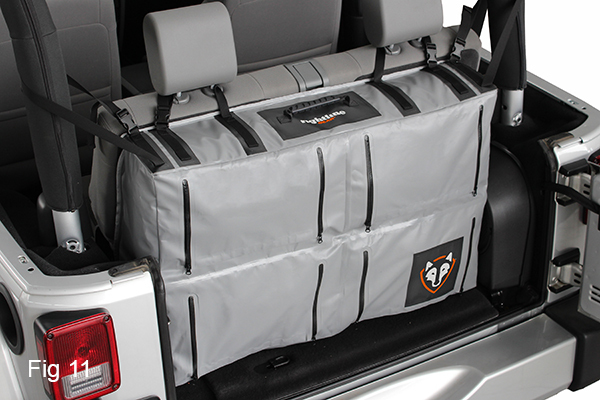 The top of the bag should follow a straight line, parallel to the top of the rear seat (Fig 12). Buckle (2) of the rear side straps through their matching attachment rings on the bottom of the rear seat (Fig 13). 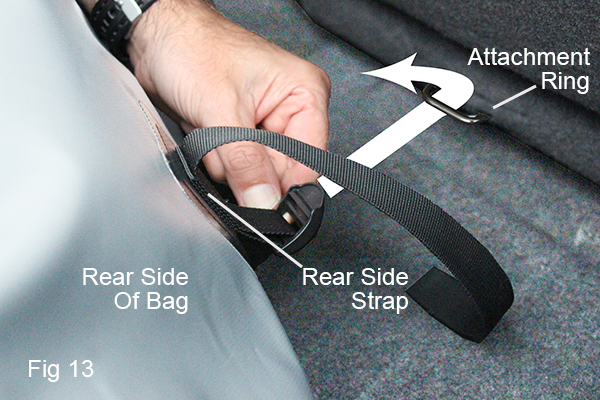 Buckle the A strap over the rear horizontal roll bar, without twisting the strap (Fig 12 and Fig 14). Buckle the D strap over the rear horizontal roll bar, without twisting the strap (Fig 12 and 15). Buckle the B strap around the left headrest, without twisting the strap (Fig 12 and Fig 16). Buckle the C strap around the right headrest, without twisting the strap (Fig 12 and Fig 17). Tighten all (4) straps. 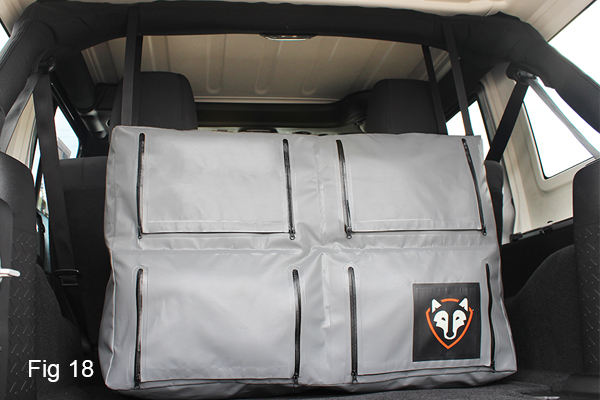 The top of the bag should follow a straight line, parallel to the top of the rear seat (Fig 18).